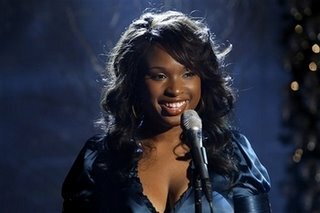 Aside from being casted in what I consider the lead role of one of the most talked-about movies this year, Jennifer Hudson has also scored a record deal, numerous interviews on talk shows and now she's gotten nominated for a Best Supporting Actress Golden Globe award. This is Jennifers FIRST acting and singing gig aside from American Idol and performing at theme parks. Way to do it big!! Jennifer does her rendition of ' And I Am Telling You": Link A MUST HEAR!! Remember Dreamgirls hit theatres Dec.25!! Wow Jhud did her thing...and how did she get vote off American Idol again??!!?? The girl can sing, but that is pretty uneventful after hearing Jennifer Holliday tear it up for so long. Also, Frenchie Davis tore this song up too. With all this being said...I will still be in the theaters on Christas Day to see this film adaptation of "Dreamgirls". This is going to be a great year for Jennifer I just know it! Love the site! Would you like to do a link exchange? Just go to my site and email me and I'll add your Blog's link to my blogroll if you'll do the same!